This model will enable you to use Four methods to evaluate your investment. Easy step-by-step instructions will guide you through the process. You are wondering, should you invest X amount of money in a new venture or should you reject it? 1. Forecast the cash flow generated by new venture over its economic life. 2. Determine the appropriate opportunity cost of capital. (Look at the stock market and find a firm with comparable level of risk). 3. Discount the cash flow. You should look at a project as if it is an independent company which assets is project X. The cash flow that you need to analyze is the free cash flow of such company, which is: Expected Earning (revenue) – cost – investment. The most difficult part is to calculate discount rate. You should see it as a choice between an opportunity of investing in the project and opportunity of investing in the capital market. In other words, instead of giving a green light to the project, you can always give the money to shareholders and let them invest it or you can invest in stock market. Then apply PV and NPV formula. NPV leads to more sound investment decisions. However, I would like to introduce other methods that are used to evaluate investment. 2. Average return on book value. 3. Internal rate of return. 1. Payback method – initial investment of a project should be recoverable within some specified cutoff period. The payback period is calculated by counting the number of years it takes to forecasted cash flow to equal initial investment. This method does not take into account the fact that different projects have different level of risk. The decision is based on a cutoff year accepted by the company. If a company accepts payback rule of 1, then both projects are unacceptable, if a company accepts payback rule of 4 than both projects are attractive. The rule treats all cash inflows before cutoff date equally and it ignores money coming in after cutoff date. 2. Average return on book value. 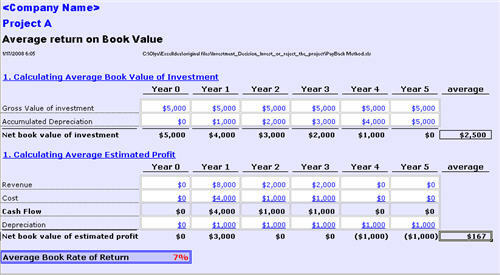 To calculate the return on book value you need to divide the average estimated profits by the average book value of the investment. The rule does not consider the timing of cash flow but rather only average accounting income. There two series problems with this approach. First, because the method considers only averages, it does not recognize the fact that immediate receipts are more valuable than future ones. The average return on book value treats distant cash flows as valuable as the immediate ones. Second, accounting income and cash flows are usually very different. The decision on either to accept a project or reject it will depend on a company accepted average return on book value, which is usually current book return. As a result, a company with a high book return on existing business may tend to reject a good future project. Or a company with low book returns on existing business may accept bad projects. 3. Internal Rate of Return. The internal rate of return is defined as the discount rate that makes NPV (net present value) equal to zero. The IRR (internal rate of return) rule is to accept a project if the IRR is higher than opportunity cost of capital. 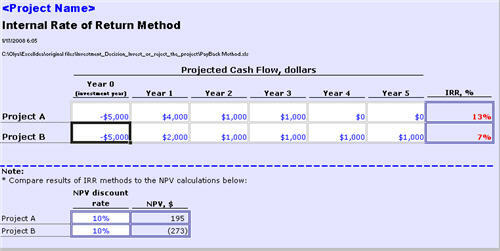 If it is than it means that the project has positive NPV. There are a couple of drawbacks when applying IRR rule. 3.1	The IRR rule, to accept projects with IRR higher than opportunity cost of capital, works only if we are investing money (landing it). If we analyze project where we are borrowing money, we would look for IRR which is lower than opportunity cost of capital. 3.2	The IRR rule may not work with projects that have double change in the flow of cash stream (mixed inflows and outflows throughout the project life). -	IRR rule may show a rate which is higher than opportunity cost of capital, however NRV may be negative. -	A project may have multiple internal rates of return. -	A project may not have IRR. In such cases IRR method will not be adequate.